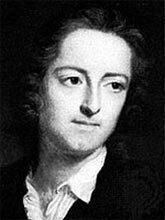 Thomas Gray was born on December 26, 1716 at 41 Cornhill, London, near St. Michael's Church in a small milliner's shop (a shop which sells hats) kept by his mother. He was the fifth out of twelve children to Dorothy and Philip Gray, however the only surviving child. His father was a "money-scrivener" that had married Dorothy Antrobus in 1709 and moved in the Cornhill house. Philip was very abusive to Dorothy, causing Thomas to have a very troubled childhood. Due to this, Thomas was sent to Eton College in 1725 where his uncle Robert, at Peterhouse, Cambridge, cared for him and his education. While at Peterhouse, Gray began to write Latin verse. His habits were studious and reflective. He and his friend Walpole, the son of prime minister Sir Robert Walpole, would send poems to Richard West, whose father was a Lord Chancellor of Ireland, in English and occasionally French and Latin. The three together contributed to hymneals to the marriage of Frederick, Prince of Wales, which later published as Gratulatio in 1739. While at college, Gray also published Luna Habitabilis in the Musae Etonenses. During this time, he befriended Thomas Wharton, a pensioner of Pembroke College, Cambridge who later became a doctor. Gray had still yet to publish any serious English poetry at this time. In 1738, Gray left Peterhouse without having degree. He left to stay with his father in Cornhill, probably to study law at the Inner Temple who admitted him in 1735. However, he inherited a modest property from his aunt Sarah and enjoyed financial freedom. Walpole invited Gray to accompany him on a grand tour of Europe in 1738. While traveling through France, Gray studied the De Bello Gallico. Before traveling across the alps, While there he cultivated a taste for French classical drama, particularly Racine, whom he tried to imitate in the blank verse Agrippina. Gray and Walpole were then accompanied by Livy and Silius Italicus before crossing the Alps and heading to Italy in 1740. During the spring months he spent time with Horace Mann, the British minister at Florence. In Florence, Gray worked on one of his longest pieces, De principiis cogitandi, which he never finished. While traveling to Rome and back then to Venice and Reggio, Gray and Walpole began to quarrel. The circumstances are unknown, however they left in different directions and parted in anger until 1745 when they reconciled. Gray left and spent several weeks in Venice before returning home alone. While away, Gray learned much about classical and modern art, but at the age of 25, he had no preparation for any career. Shortly after Gray's return to London, his father died on November 6, 1741. Also, he found his friend Richard West troubled by his family and personal failures. They once again came close friends. In the coming years Gray visited his mother in Stoke Poges, near Slough in Buckinghamshire, where his mother and her sister Mary retired from business in December of 1742. The spring and summer of 1742 were filled with creative activity for Gray. His return to Buckinghamshire's countryside inspired him to write one of his most famous poems, Ode on the Spring. Unfortunately, shortly after he received the news of the death of West, age 25, to whom he grew so close in recent years. His loneliness and sorrow followed him in his writings; Ode on a Distant Prospect of Eton College, Ode to Adversity and Sonnet of the Death of Richard West were all written before the end of summer.